There’s nothing like spending a quiet night with a hot cup of tea and reading for pleasure! While the Rushkoff book is directly related to my research, it’s an easy and accessible read on a relatively complicated issue of programming and contemporary culture. I plan on finishing up Saturday afternoon. 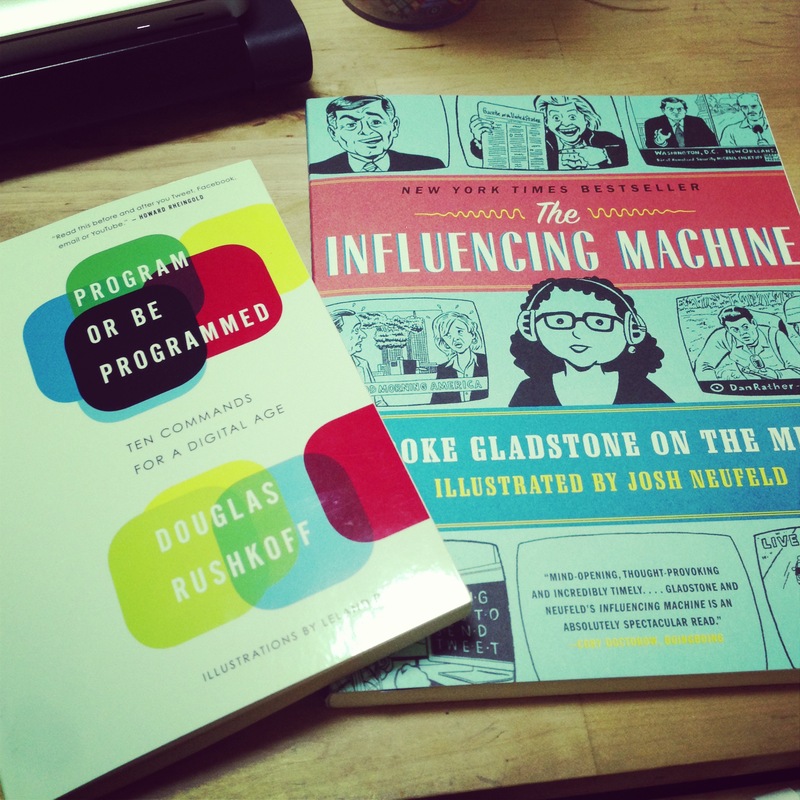 As for The Influencing Machine by Brooke Gladstone, I’ve eyed this book since it came out and finally picked up with Program or Be Programmed. I’m a huge sucker for graphic novels and perused this one in particular since it is describes the history and current state of media. I’ll let you know how that one turns out. It looks great considering she covers topics from government outreach to journalism to fairness bias to the notion of objectivity. In any case, I wanted to throw something on the blog since I’ve been busy with work, school, and a few freelance projects (which I will be posting soon – hint: Asterisk SF’s next issue is the IDEA issue and a few curatorial contributions in the pipeline for a couple of larger art shows – fun times!). All right, I should get going. It’s not even Friday, it’s EARLY Saturday morning! Eeeesh. Til next time! !